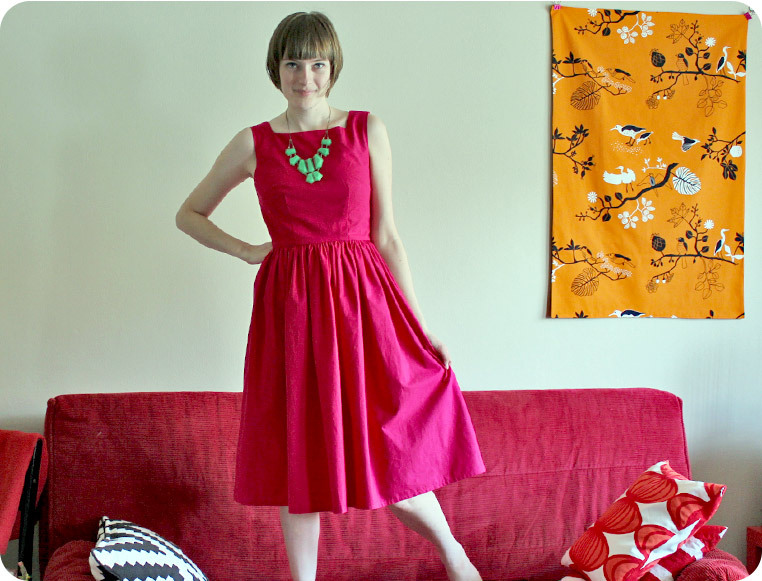 I got a question about how much I lowered the neckline of my Burda shift dress (Burda 7056). So I thought, why not just post what the alteration looked like?! Please click on the image below to enlarge it! 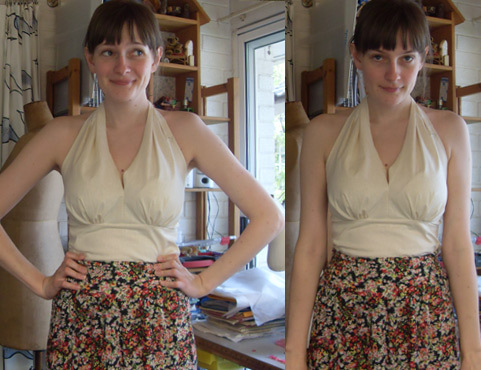 Edit: I forgot to add that I lowered the neckline by 4cms (thats over an inch in imperial measurements). You can see it isn’t the original pattern from the envelope. 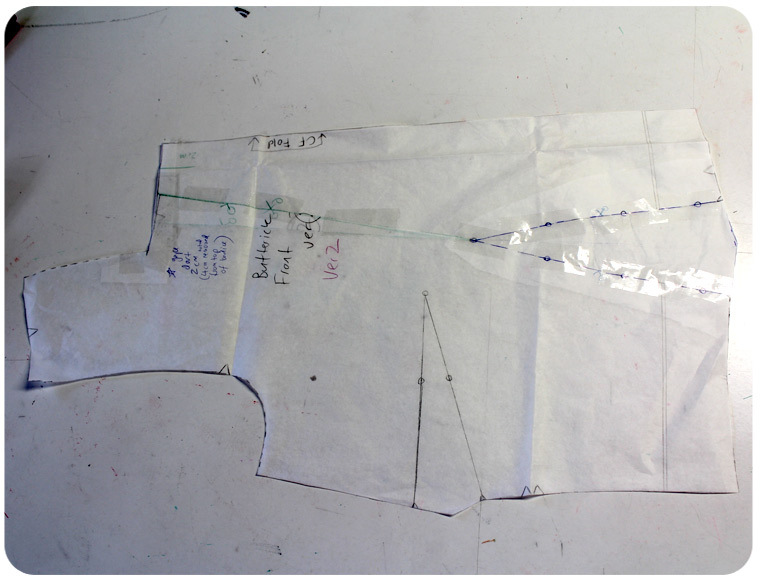 This is because I trace the original sewing pattern, that way if I need to make a different size I can. Does anyone else re-trace their patterns? 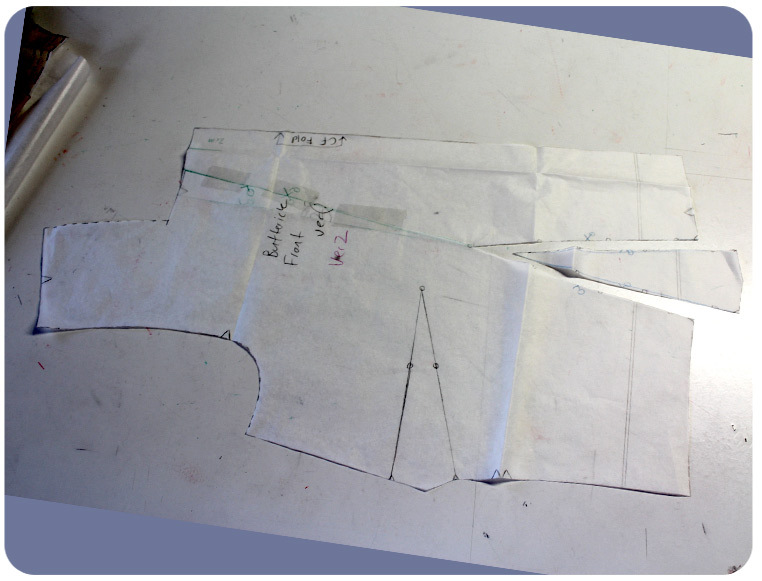 It is a lot of work….I know some people fold the size of the pattern they want to cut out, but that doesn’t work for me. I confess that I often buy doubles of the same pattern, that way I have one altered version and one with all the sizes. 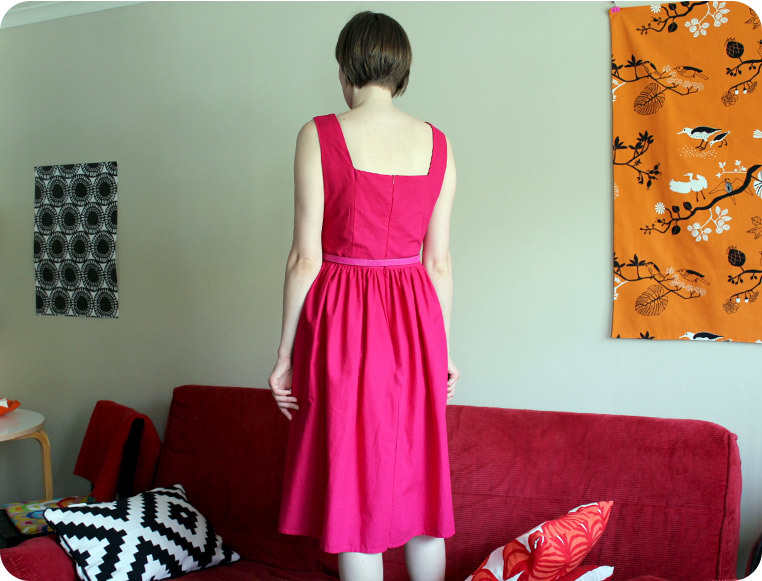 Note how even after I altered the neckline of this dress, it still sits pretty high. So if you are working with this pattern and you don’t like tight/restrictive necklines, you will probably want to alter this! Fitting revelation and “wearable” muslin. Yes it makes sense now! Most peoples shoulders slope more than mine, I have quite square shoulders so by taking excess out from the shoulder seam it fits better. Note: The diagram is exaggerated and inaccurate but you get the idea! Perhaps it counter-intuitive to remove fabric near the neck if you have boxy shoulders, but for some reason it worked for this pattern. I did remove a lot less, and it what I did take out was less slanted than what I drew in mu crude drawing. So it is an improvement, but I don’t know if I like the loose fit on me but I do love the fabric! I had a dress in the same colour and print when I was a little girl and it was my favorite dress. 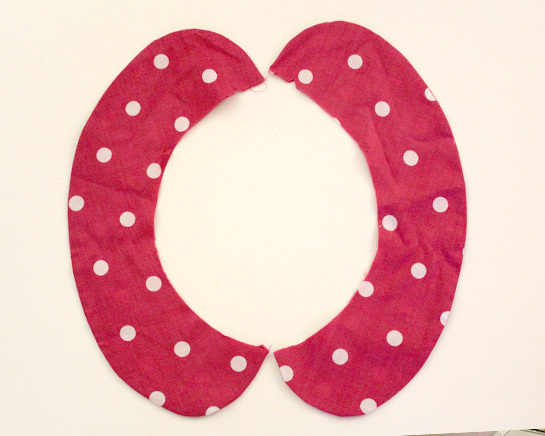 I have plenty more of this fabric left, so I am sure I will make something much cuter with it. 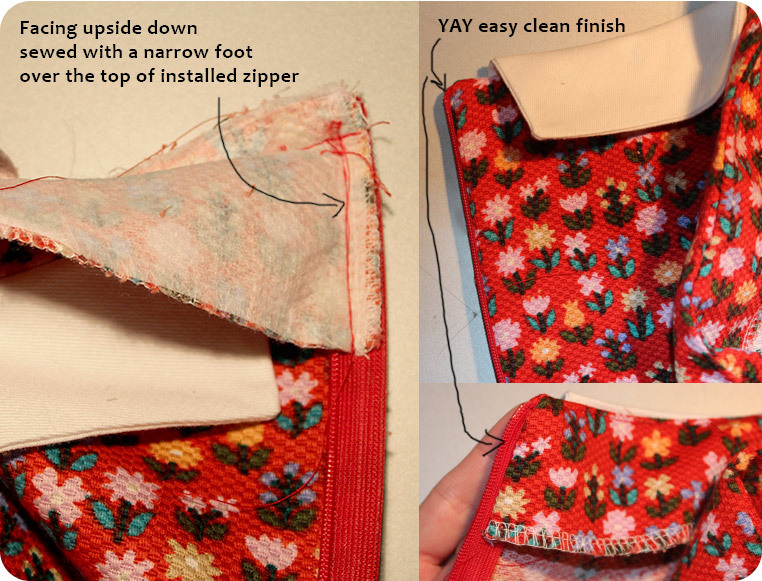 I am happy I tested out this pattern in a fabric I had plenty of, because I dont know if it is worth making again. If I do make it again, I want to do the bias binding before I sew up the site seams, and it will probably make it 100 times easier! Tip: Its worth investing in some good quality pinking sheers. 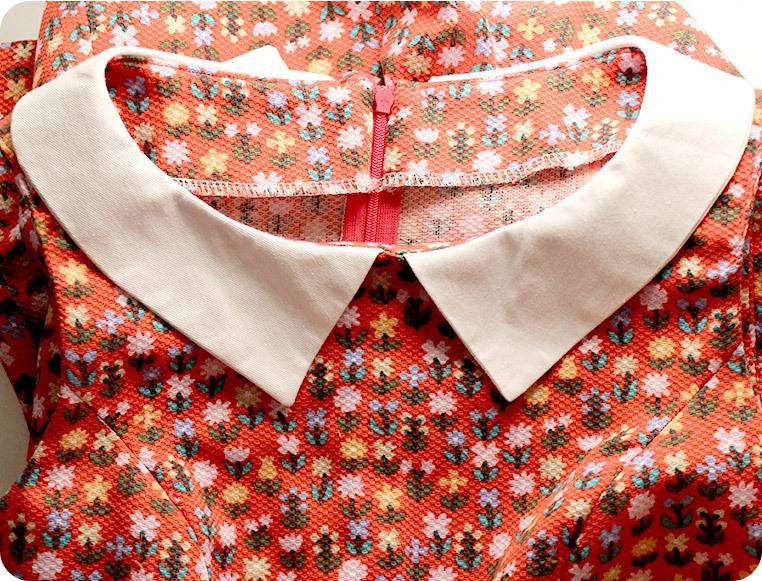 I used my new ones to grade the seams on my peter pan collar and it worked a treat! Just grade the seams with the pinking sheers and go over the seam line with a point turner and press. Super quick! I left of the interfacing, to see how that would change the look of it. Anyway thats the end of my story. 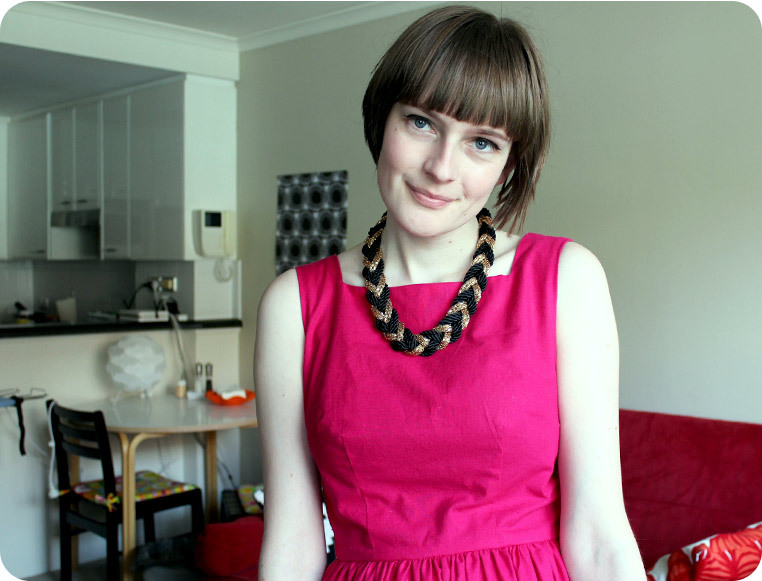 I have something much more exciting for the next post, it just may be my favorite dress ever. I have enjoyed reading everyones 2013 recaps. All of the sewing blogs I read are full of sewing inspiration but its reassuring to read that everyone has sewing fails from time to time. 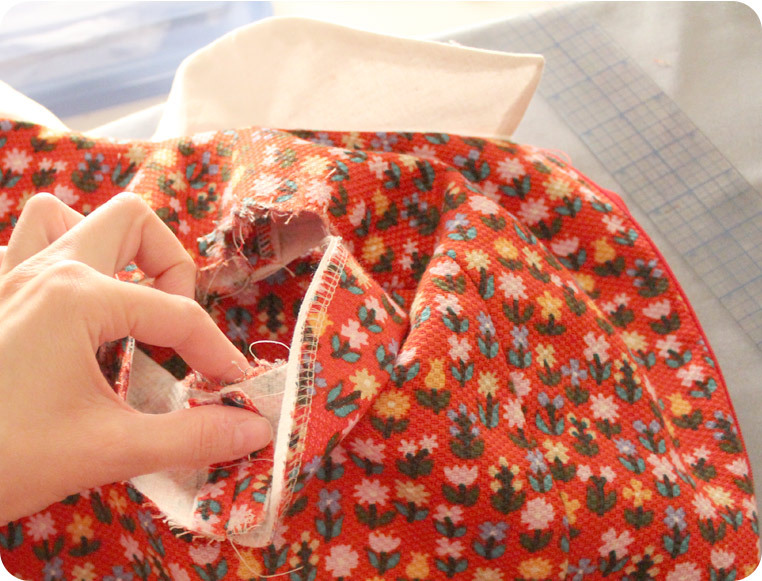 Sometimes it’s impossible to predict which projects will be the highlights and which ones will go unworn, but no matter how the projects turn out its good to know we are always learning more and advancing our sewing skills! Hope everyone is having a good 2014! The dress is done (will post it tommorow) I thought I would share some notes and work in progress (sorry last boring post I PROMISE). Above: The zip is straight IRL I promise! it’s just how the fabric is lying, dammit! Recently my body has changed so I feel like I am fitting for a different one now. I don’t actually look any different, It’s just that clothing fits me differently. I guess it’s a symptom of walking everywhere and being low on money. Above: My initial alterations. You can see the first lines where I took it in at the bust. I drafted my own collar. I drew some VERY rough guides on my muslin of my desired collar because I wanted to get an idea of how it would look like. I also drafted a wacky ‘all in-one facing’. I generally prefer linings to facings, but I am planing on wearing the dress during the Australian Christmas (summer) so I wanted it to be light to wear. Oh yeah I also shortened the dress A LOT. I forgot to record how much I shortened it by (SO ANNOYING I should always record these things. It’s helpful!) 😦 Anyway I would guess I removed about 20-23cm or over 8-9 inches from the hem. Fitting: I found myself removing some excess in tiny amounts at the upper bust, bellow the bust and a little at the waist (getting rid of the excess in the princess seams or panel lines). I did not change the neckline at all. It’s a higher neckline, but happily it’s a comfortable/non-strangling one (a rarity among patterns with high necklines!). I originally created two muslins/toiles for this project, but I ended up making more fitting adjustments on the dress after I made it in my fashion fabric as well. 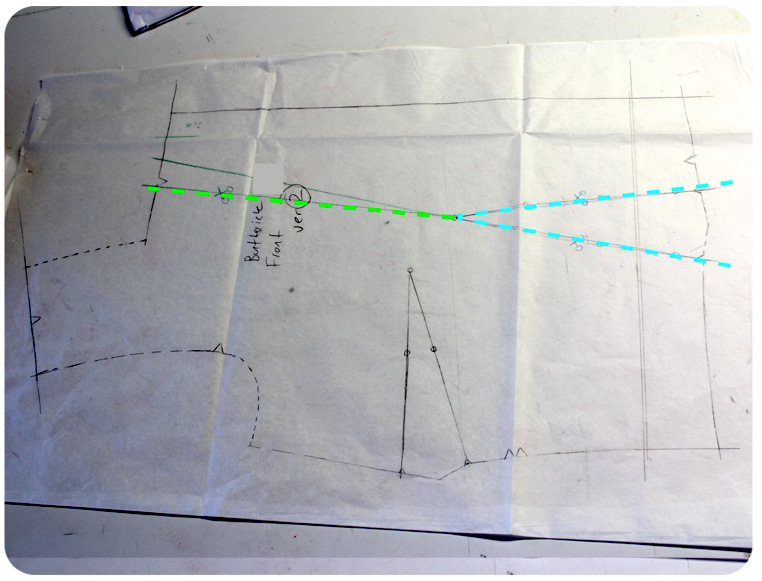 But after all the tedium I now have a pretty rocking basic a-line dress pattern :)! 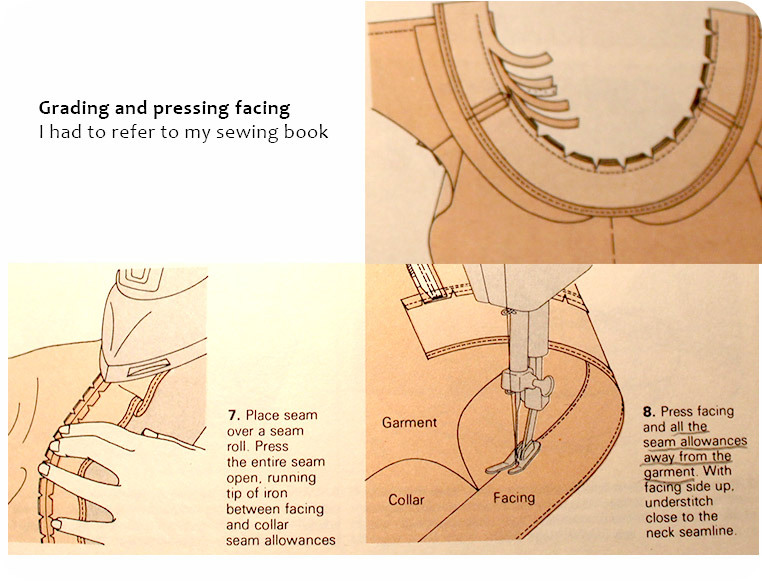 I usually work with linings or bias binding, so I had to look up some info on pressing collars and facings in my trusty sewing book. Note to self: When pressing facing. press down the middle of the seam first spreading them apart,trim/grade seams them press ALL the seams TOWARDS the facing (not towards the garment). I know a lot of people know this technique already, but for those who don’t: I swear by it it! 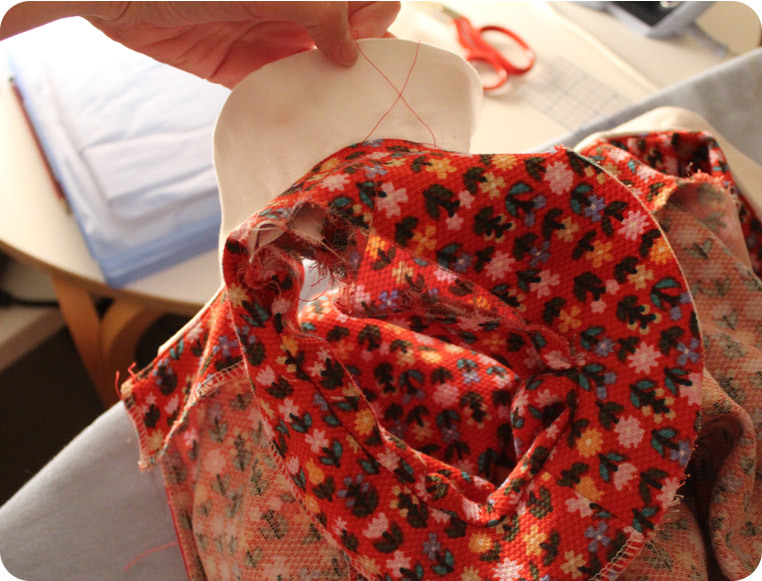 Now come the pictures of how I attached the facing to the armhole without any hand sewing. This is a weak attempt to remind myself of what I did. 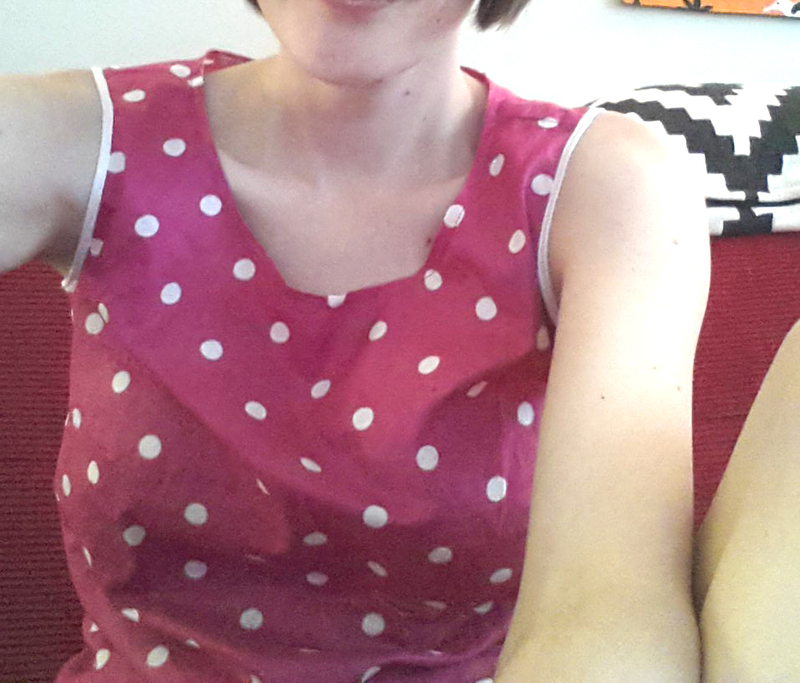 Another dress (I should have called this blog ‘another dress’ hehe). 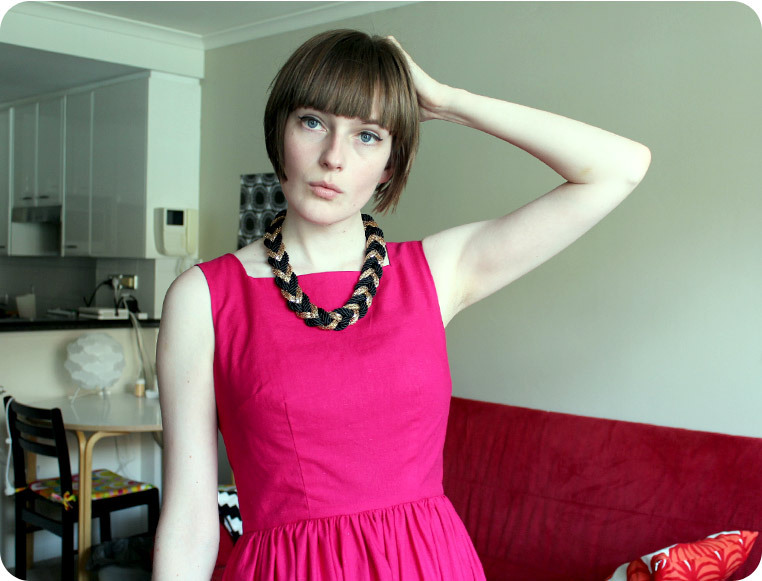 I wanted a bright dress that would go with many different necklaces. I just came back from a trip out with my mum in which we had lunch and went fabric shopping. The Remnant Warehouse has a buy-one-roll-and get-one free sale on its off-cut fabric rolls and lets just say money was spent and awesome fabric chaos ensued. 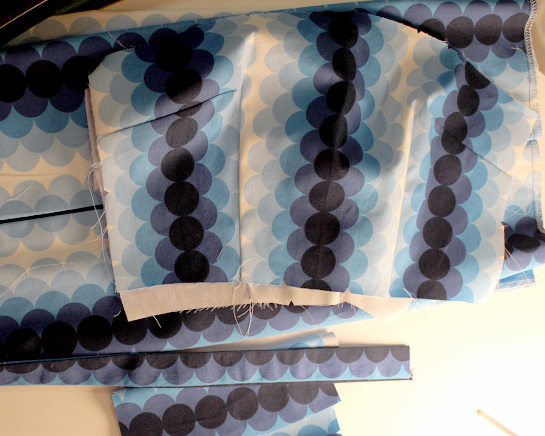 Most of the fabric I got was as low as $3 per meter, SCORE! I used Butterick 5032 again (my first Butterick 5032 dress is here), but this time rather than adding the fitted skirt it came with added a gathered dirndl skirt instead. There comes a time in every sewists life where they are relieved to have completed a flawless invisible zipper installation. The zip is perfectly encased/between the lining and the fashion fabric and you are ready for to try it on…then the zip gets stuck. You gently tug a few times until the tugging becomes not-so-gentle and of the more the anxious variety then BAM the zip goes off it’s tracks, the more you panic the worse it gets till there is a tear in the zipper so it’s back to square one. The sheer frustration/annoyance! You look up towards sky with your arms up and if there was a camera above you it would be panning out as you scream NOOOOOOOOOOOOO! Time to kill another 40+ minutes and put a new zip in just when you thought you were done. I have a sneaking suspicion it had something to do with the zip itself. I know what you are thinking ‘a bad tradesman blames his tools’ but this was a brand I don’t normally use and it was pre-packaged (blah so pointless and wasteful) and when you take the zip out of the stupid plastic packaging there were bends/kinks in it. Of course I was sort of lazy and blasé about the original zipper and thought ‘ironing an invisible zips is for suckers’ well lets just say I was very happy that I ironed the second zip that was also deformed due to unnecessary packaging, because it was hard to zip up and down fresh out of the plastic too! I am not entirely happy with the fit of this dress for a number of reasons. Especially the back. 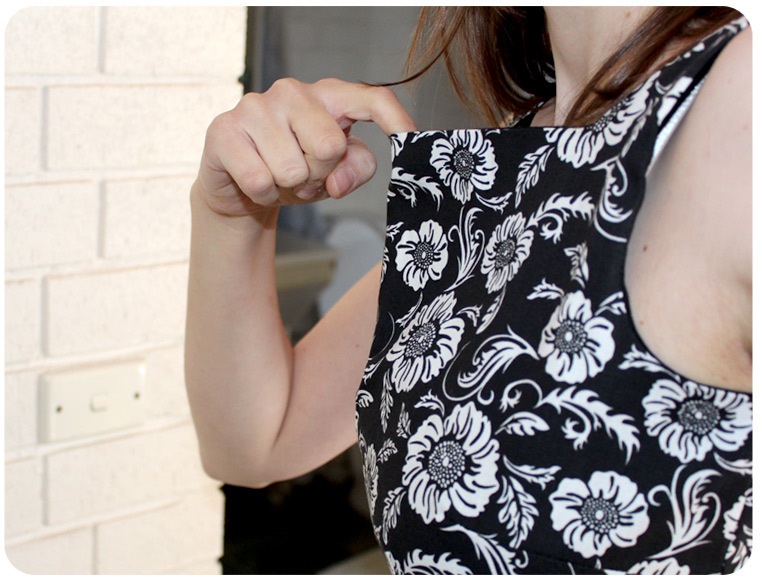 Originally I was going to remove 2cms gaping fabric the front neckline from this pattern by putting the excess fabric in the dart which I did a tutorial for here, but I ended up going with 7mm on each side but now I wish I removed more. The back is crazy. I thought I could use the same technique I mentioned aboce for removing gaping at the the back, which turned out to be completely ridiculous because the gave me excess fabric in the middle of my back. Why did I think that would work? 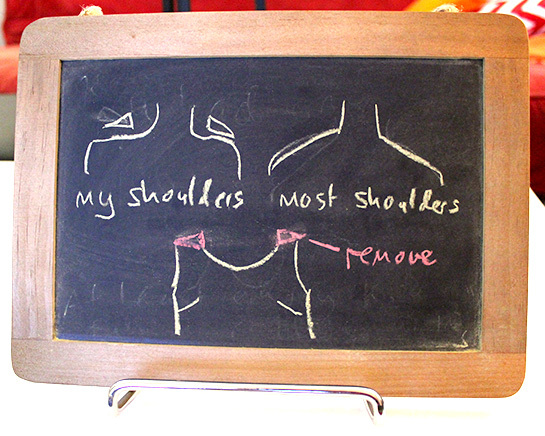 Happily I don’t have breasts on my back, but that would be the only way that alteration would have worked. I ended up having to lengthen the back darts. It I ever make this dress again I will change the darts to pannel lines (in the back of the dress) and remove 2cms from each side of the newly created panel lines. Also its probably wise to remove the same amount from the front and back of the necklines. You learn so much through error with this fitting business! I really like the idea of having lots of articles of clothing in strong bright solid colours (no patterns) so I can have fun with my ever expanding collection of accessories. I usually go above the knee on dresses and skirts put I sort of liked the more demure length. Even the boyfriend said he liked the longer skirt he mentioned that it worked because of my shorter hair. I guess I can always shorten it, but at the moment I like it. It’s good to get an opinion from a partner. 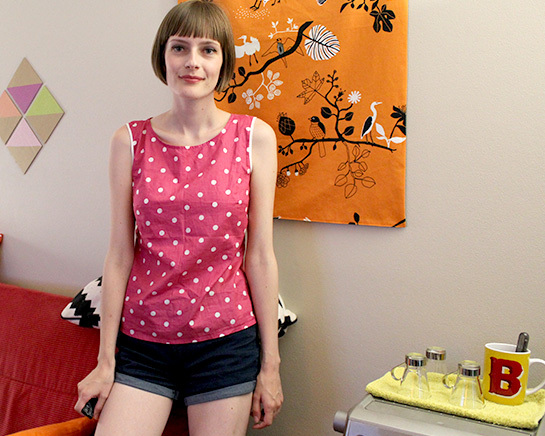 Once I made this very high-waisted skirt with a very big repeating pattern, when I tried it on I thought something was awry and he told me very tactfully that it was not a good look, yay for nice yet honest style advice! I wish I could move past the fit because there is a lot I like about this dress. I just have to tell myself that if I bought it RTW I would not be as fussy and that a little bit of excess fabric is not the end of the world. Above: don’t you hate this effect? 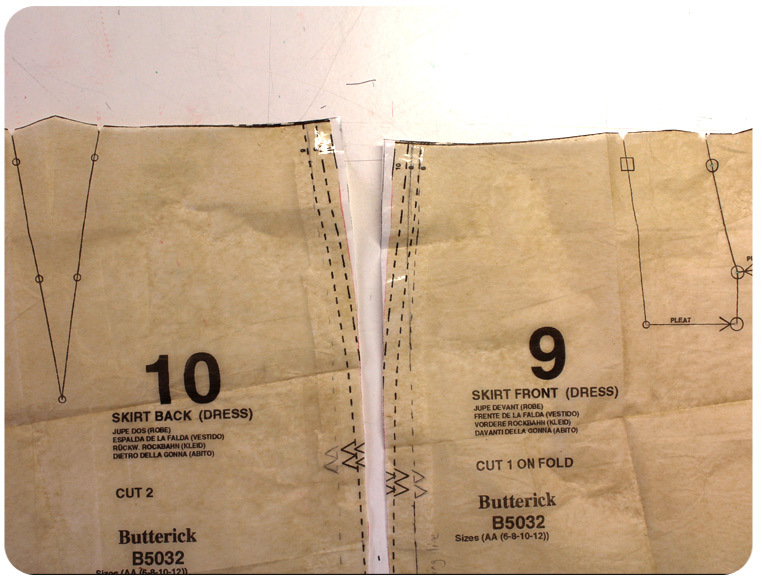 So as I mentioned in the last post a lot of commercial patterns (including butterick 5032) gape on me. 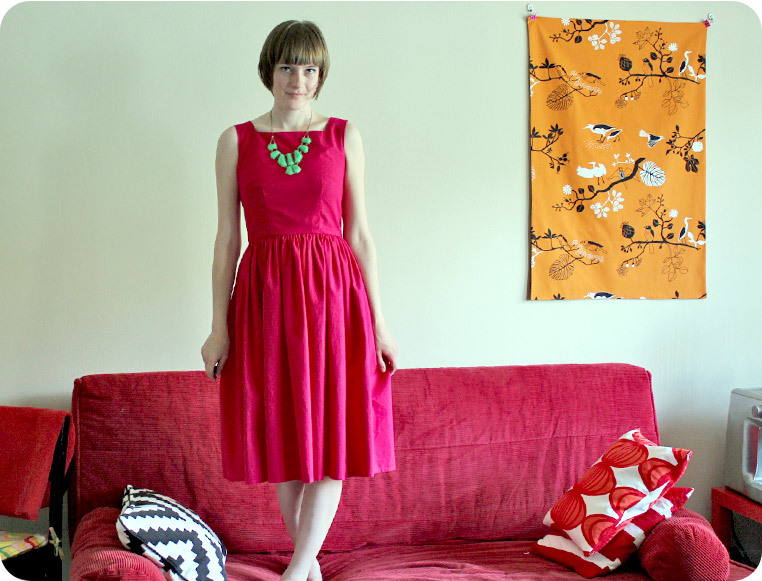 There always seems to be excess fabric near the neckline that is lose. So in case anyone else has this problem here is how to eliminate it on the pattern. 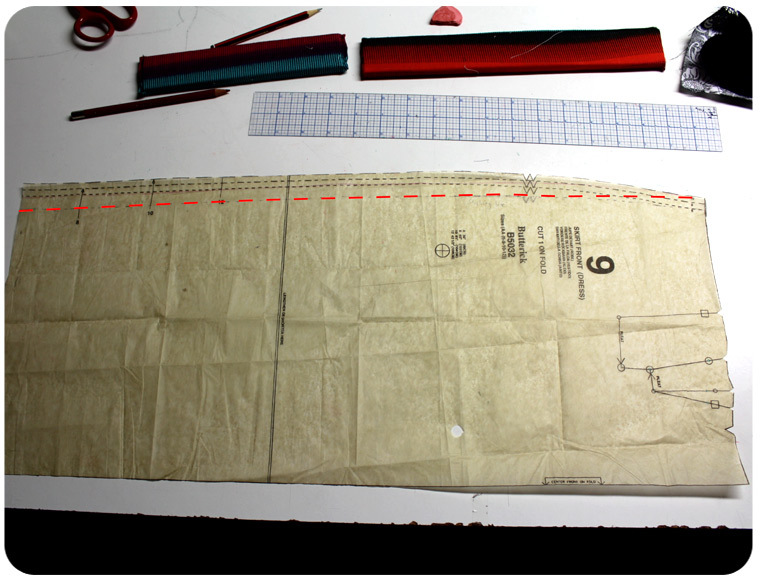 You cant just take it out of the middle of the pattern because it will affect the grainline and the waist measurement so here is how to do it. 1. So after making a muslin or prototype try the dress on and pinch and pin out the excess fabric and measure how much you have pined out is the amount you want to take out. On one side of my bodice that was 2cms (making it a total of 4cms excess fabric, but 2cm is the amount we want to remove because we are only working with one side of the pattern). 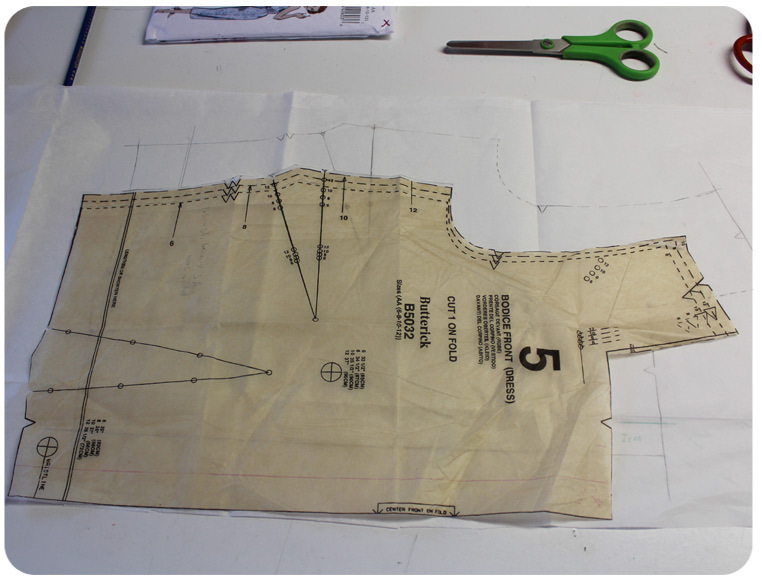 I made a copy by putting Burda tracing paper and pattern weights over the bodice pieces and tracing it being sure to mark all notches and darts on the new pattern. Dont know why I photographed the original pattern over my traced one but um yeah should be the other way around. 4. Cut along dashed lines. Where to cut is shown above as indicated by the green dashed lines in the picture above. where these darts meet in the middle cut leave 1-2 millimeters (or a tiny bit of paper) so that the pattern is not cut directly in half. Below: temporary dart is now taped shut and bottom waist dart is larger resulting in the excess being removed. 5. Add paper to the now larger gap in the waist dart. If necessary add paper and blend and the neckline too. 6. Above is the new gape-free pattern piece. 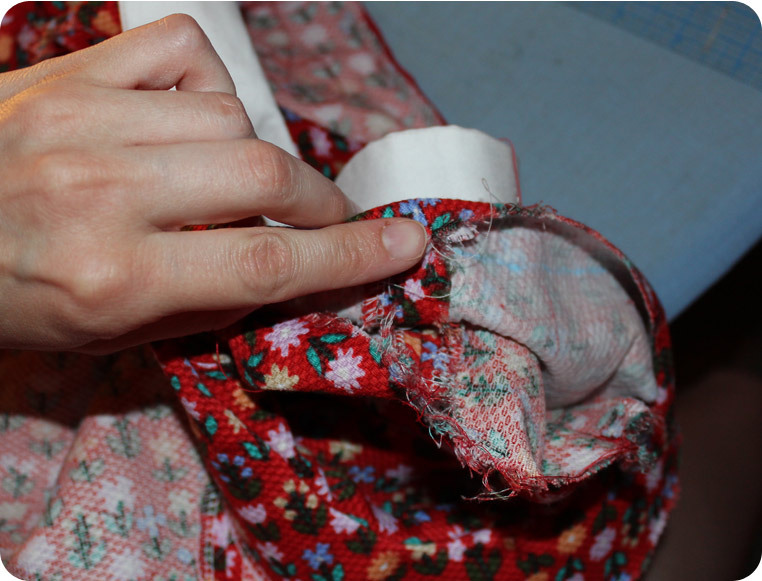 I used the same method to remove excess in the back bodice pattern piece too. So I fell for this pattern. I love the square demure neckline with the fitted skirt and bodice. 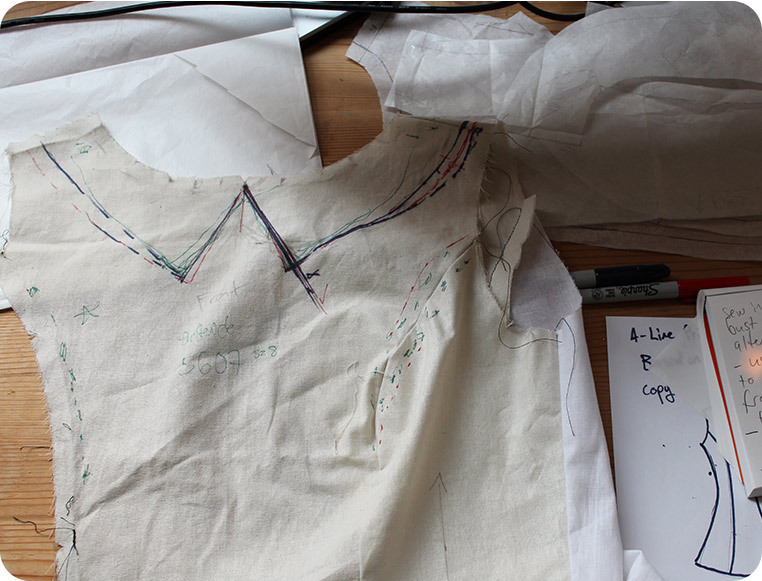 I did not know what I was in for (fitting wise) but I was not prepared to make a calico muslin/prototype. 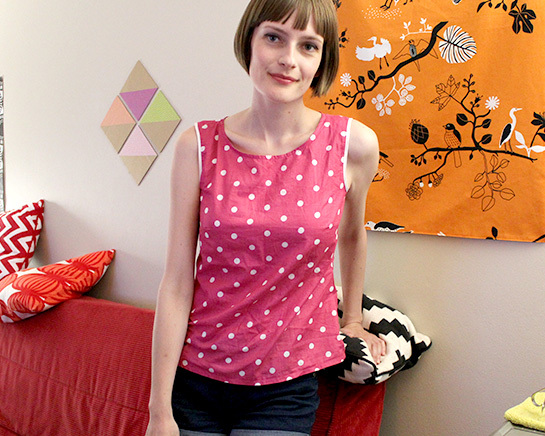 So I made it up in a fabric that I had a lot of as a sort of wearable muslin. I am 90% finished making the dress. 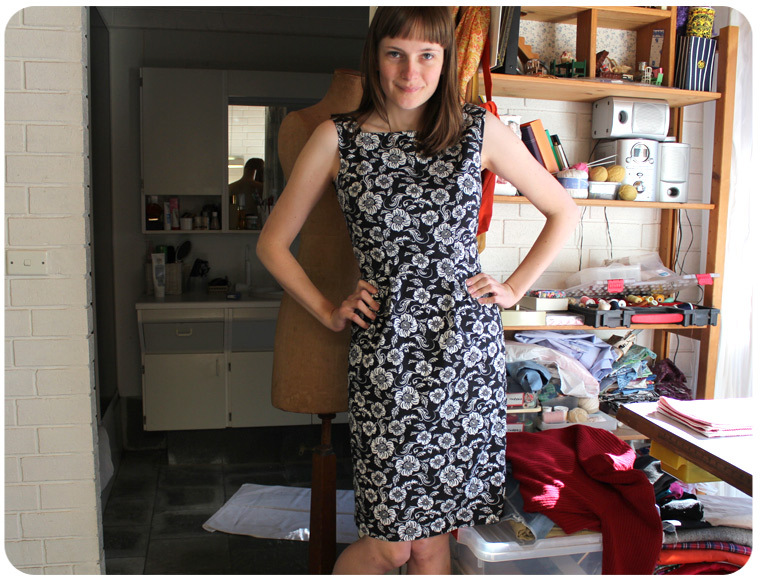 Below is how the dress (Butterick 5032) looked after I got rid of all the excess fabric in the skirt. But as you will see it took some time to get to this point…The skirt skims the curves but there is still room for movement there, I could afford to get rid of more but I usually over-fit so I tried not to go over board. Sorry about all the mess in the picture. If a comerical pattern was to fit someone exactly out of the envelope I am convinced the wearer would have a minuscule waist, breasts above armpit level and either have hips that are disproportionatley big or insist on an absolutely ridiculous/frumpy amount of wearing ease in a “fitted skirt”. Or perhaps I am the one with the weird body. I always just thought I had an hour glass shape. 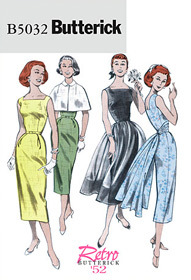 But in Butterick world I have an enormous waist and tiny hips. My hips and bust are exactly the same measurement (envelope says: size 10, size 12) and My waist is a size 14 ( well according to the pattern envelope). Above is how I amended the skirt. 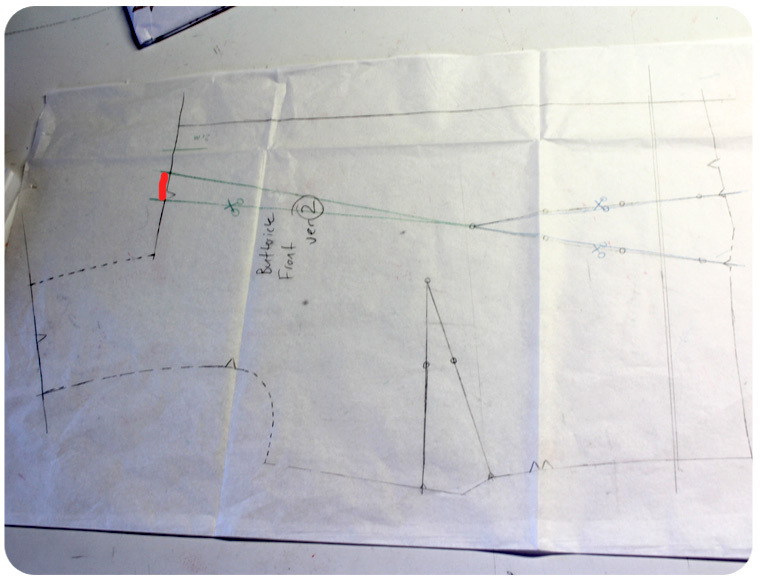 (The red line is where I cut off the pattern and includes seam allowance). Then after decreasing the size and roundness at the hips and legs I then added a little extra to the waist. I also tapered the skirt in near the hem (so it would look a bit more like the design on the pattern envelope (it has a vent so you can still move easily). Above is what I added to the waist. I also added 0.5cm to the side seams of the bodice, now I have a bit of ease and I can still wear the post food bloat (sorry if that was too much information). 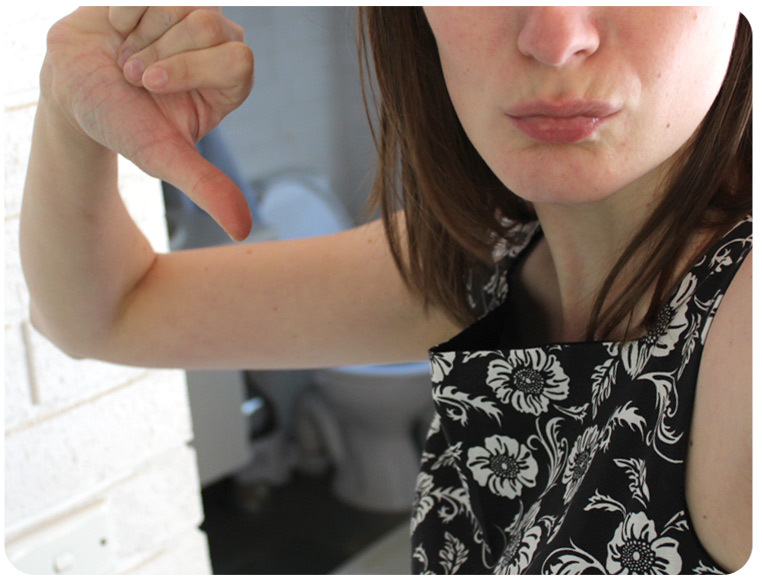 So pictured above is my biggest grievance, this gaping effect (sorry about the loo in the background btw). Does this happen to anyone else? It seems to happen with all the fitted dresses I make. Perhaps it’s because the space above chest and just bellow my collar bones is a lot more concave than the average. Or perhaps its just a bad drafting of the pattern. Anyway I have fixed it on the pattern for future dresses but I don’t think I will worry about it on this one, It was sort of a wearable muslin anyway. Also I am LOVING… Underlining! This is the second time I have tried it. 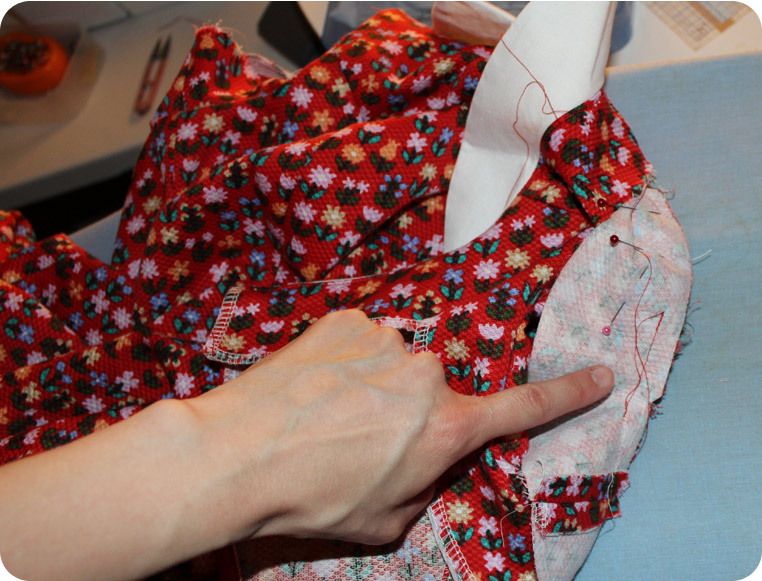 You are essentially just making the fabric thicker by basting another fabric to the backside of your fashion fabric (I do this my basting around it with a long stitch on my machine but some people do it by hand-stitching). I underlined the skirt to give it stability but there was another unexpected benefit. This is the finished hem of my skirt (I kid you not!) Do you see any stitches? Thats because when I used the invisible hem foot on bernie (my bernina) the stitch picked up the underlining fabric only so that so see absolutely no stitching on the right side of the fabric. How brilliant is that?! 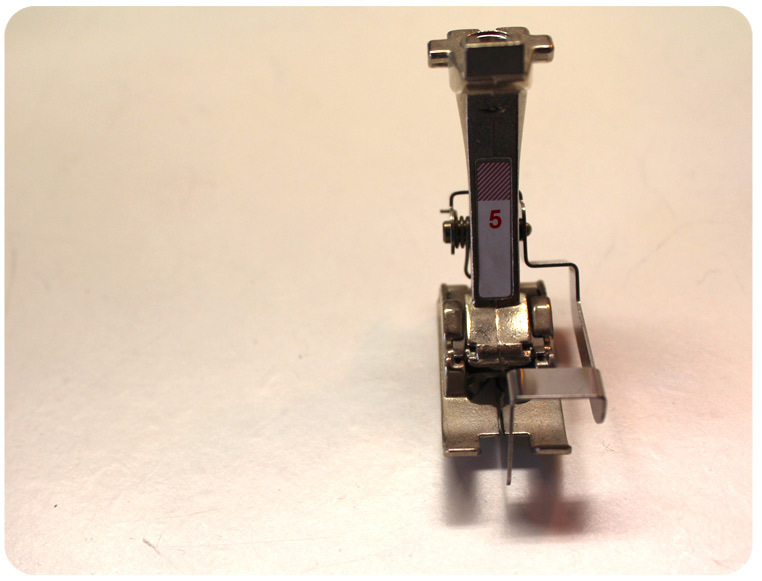 Also here is the glorious foot I use to to the invisible hem stitch (stitch 7). OK now we have established that I am a sewing geek. Now we’re getting somewhere…..I do have a soft spot of the crowded house song for the same name haha. Wow I just discovered that was released a year after I was born hehe… yey 80s! LOL I do kind of love my goofy expression! I almost gave up on this dress but now I figured out the obvious fitting issue that would make the top of the bodice sit better (I am still working on the back and the band). It was so obvious but for some silly reason I originally resisted my urge to lower the streamline connecting the gathered front halter piece to the midsection/band. It was not sitting under my bust, resulting in a bad fit. If I just asked myself “How do I differ from a size 10 fitting model?” I would have made the right adjustment a long time ago. So how do I differ? I am not a small bra cup/size and I am not ahem as erm….lets just say my breasts don’t naturally sit high up near my armpits and I am NOT a teenager. Moral of the story is WHERE things are sitting can be just as important as HOW things are sitting. As for the midriff band I made so many dodgey winging-it alterations on things I can sort of see why it would be pulling. But I am addressing that next! Rather than following the dreaded suggestion from the pattern of putting boning in the back I am planning on just adding shirring to the back . I know Betty drapers dress would be a lot more dressy but this is my spin on the dress so I decided its still accepatable. 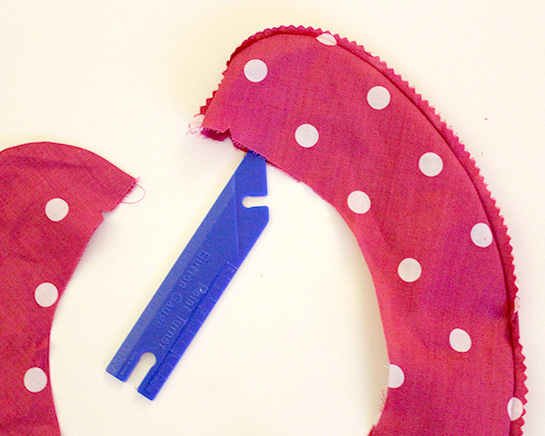 I have never worked with shirring/shirring elastic before but I found a good tutorial here. 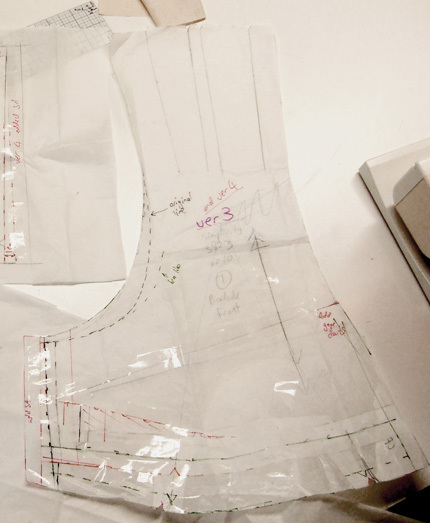 That would solve the fitting issues in the back and ensure it stays up rather than the dreaded suggestion from the pattern of putting boning in the back. 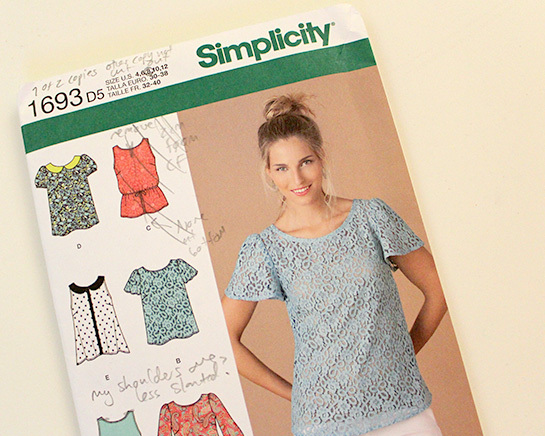 Rule of thumb: The uglier the pattern pieces become-the better the fit. 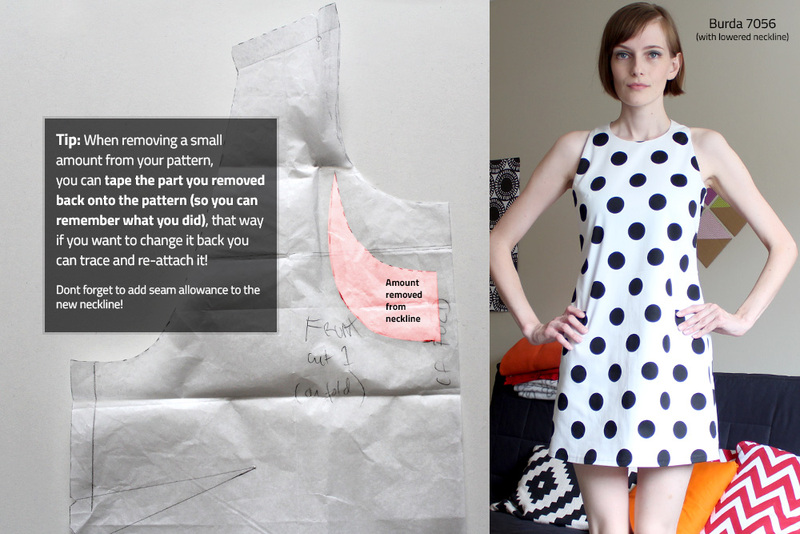 Haha Amateur pattern adjustments TO THE MAX. I SHALL FINISH THIS DRESS. I am going on a big trip to Europe soon so I better keep working on it. Hmmm Perhaps I should name every post after songs I like. Would that be wrong?